Irene Andrejczuk, a Certified Naturopath in Montreal, (NHC, AMCC in Quebec), as well as a Clinical Nutritionist; Weight Loss Coach (PNI); Kundalini Yoga Instructor (Equilibrium, Montreal ); Reiki Master (in accordance with the Usui Shiki Ryoho tradition); NLP Practitioner (Win Vision Quebec). If you would like to eliminate your symptoms and start feeling your optimum best, you can complete this Hormone Balance Check List. The symptoms of hormone imbalance vary and evolve over time. This checklist can ease your mind and help provide you with important preliminary information. Once you have completed the checklist, you can send an email to irene@optimumhealthclinic.ca and receive a FREE 15 minute consultation with her to discuss your results. 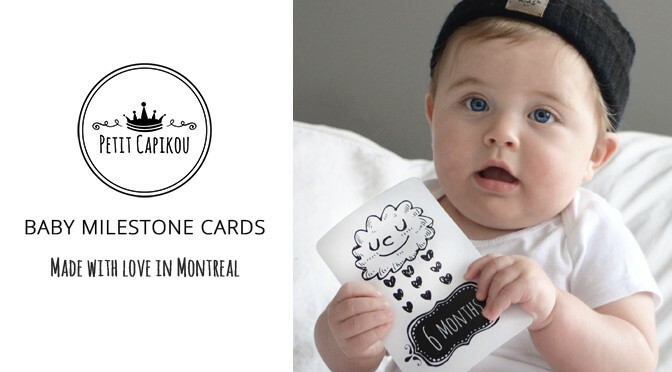 A Montreal mom designer and entrepreneur created something that we can all use. She wanted to keep milestones of everything her child did, especially in his first year, knowing many other parents feel the same way. Some people love scrapbooking, yet she feel it’s very time consuming. She wanted something quick, easy, creative and memorable. There were some cards out there, but nothing really stood out to her. She wanted to create something more unique and trendy. She decided to create Milestone Cards. Milestone Cards are a great easy way to capture all the special moments. There are 27 baby milestone cards which cover milestones from the birth of your child all the way to their first birthday. You simply take pictures of your baby’s milestones and match them to the Milestone Card. This way, you will never forget the day your baby laughed for the first time, ate solid food or said “mama”. On the back of the cards, you can write details and memories of each of these special moments in your little one’s life. The Milestone Cards are packaged in a drawstring natural muslin bag. This makes a perfect gift for a baby shower or new baby arrival.